It would be fair to say I picked up this book with some scepticism. Would it be a glib hippie trip through eastern practices by some white American dude living in Oregon*? If you have a name like Solala, are you destined to write a book on meditation? Fortunately, Solala Towler appears to be the real deal with enough experience with eastern arts to convince me he isn’t an interloper or guilty of gross cultural appropriation. 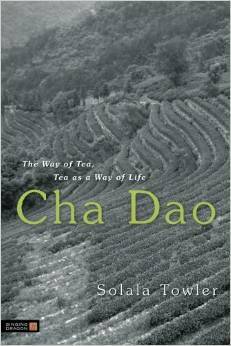 Meaning ‘the way of tea’, Cha Dao is a beautifully concise piece of work. Towler structures the book as lessons in Zen and Daoist teachings, using anecdotes featuring historical figures as well as from his own travels to illustrate how tea can contribute to our enlightenment. For anyone who has every seen or practised gong fu style tea service, you will understand that drinking and appreciating tea necessitates being in the present to receive the full benefits of this wonderful drink. Each chapter of Cha Dao serves to emphasise different aspects of this experience, from presence to wisdom to humility. Those who know a little of tea’s history will be familiar with names like Lu Yu, he who literally wrote The Book of Tea, and Sen no Rikyū, Japan’s most famous tea master, and may even recognise some of the anecdotes. However Towler does a great job of smoothly giving the context and gracefully presenting the narrative in a way that makes even repetition of these stories enjoyable. My favourite is probably the lesson on wu wei, roughly translated as ‘spontaneity’ or why you should ‘go with the flow’. A drunken man falls out of a cart; though he may suffer, he does not die. His bones are the same as other people’s; but he meets the accident in a different way. His spirit is the condition of security. He is not conscious of riding in the cart; neither is he conscious of falling out of it. The mix of historical and personal anecdotes works well for the most part, though a little more thought to chapter order made have made the lessons more cohesive. Where this book falls down is the last couple of chapters where Towler becomes more informative about the processing and preparation of tea and switches to a more instructive tone. I believe he could’ve excised this aspect altogether and focused on the dao and the book would’ve felt, if not complete, then at least whole in itself. Verdict: The writing is fluid and lessons easy to absorb and I believe this level of succinctness is very difficult to achieve so I tip my hat to him. This is definitely worth a read—it shouldn’t take you long—and if you own a copy, you’ll find yourself dipping back in to re-read your favourite stories from your favourite chapters. *Yes, I understand this is racist. This entry was posted in books and tagged book, Lu Yu, review, Rikyū. Bookmark the permalink.